Hanoi (VNS/VNA) - Vietnamese shares have risen during the last three sessions on both the local exchanges, but this rally is not expected to sustain through the last trading week of August. This is because investors will try to accrue profits from their recent gains, while supportive business-market information is lacking, according to experts. The benchmark VN Index on the HCM Stock Exchange gained 0.24 percent to finish the last trading week at 771.63 points. It has rallied totally 1.4 percent over the last three sessions. The HNX Index on the Hanoi Stock Exchange added 0.34 percent to end August at 102.64 points, extending its gain for a third day with a total growth of 1.8 percent. The three-day rallies of the two indices helped them recoup the losses incurred in the first two sessions of the week and end the trading week higher than the previous one. The VN Index posted a weekly gain of 0.3 percent, and the HNX Index rose 1.8 percent week on week. The three-day rallies on both the local exchanges were attributed to the improvement in the bank stocks, which benefited from a draft circular released by the State Bank of Vietnam to collect public opinions on the extension of the schedule requiring commercial banks to reduce their maximum ratio of short-term funds used for medium- and long-term loans from 60 percent to 40 percent. The current timeline requires the commercial banks to reduce by 2018 the maximum ratio of short-term funds used for financing medium- and long-term loans, while the draft circular suggests the commercial banks should complete the action by the end of 2019. The news boosted bank stocks such as MBBank (MBB), Vietcombank (VCB), VPBank (VPB) and Asia Commercial Bank (ACB). These bank stocks advanced between 0.7 percent and 6.5 percent in the last three sessions. Energy stocks were also supported by the rising oil prices during the week. Brent crude rose 1.4 percent since Monday, pushing up the prices of PetroVietnam Gas (GAS), PetroVietnam Drilling and Well Services (PVD) and PetroVietnam Coating (PVB). Speculative stocks also performed well, including those of property developer FLC Group (FLC), FLC Faros Construction (ROS), FIT Group JSC (FIT) and Benovas Pharmaceutical Company (DCL). FLC and FIT increased by one-fifth each during the week, DCL surged nearly 10 percent and ROS advanced 4.8 percent. According to the brokerage firms, the markets would face difficulty in extending their gains this week, as investors would try to take profits from the recent gains in the share prices, such as those of banks and property developers. BIDV Securities (BSC) wrote in its weekly report that the market rallies received strong support from speculative stocks, while the trading of blue chips was not positive, therefore, the rallies were not stable and strong enough. In the coming week, if investors continue to keep focusing on lower-priced, speculative stocks, rather than making investment in large-cap ones, they could make large-cap stocks suffer and increase the risk of margin lending for the market, BSC said. According to Vietnam Investment Securities (IVS), the current market conditions are not attractive enough for investors, as there is a lack of supportive news and information. It also explained why the daily average trading liquidity last week fell from the previous number, as investors would rather keep their money safe and secure, than disburse it into local stocks. 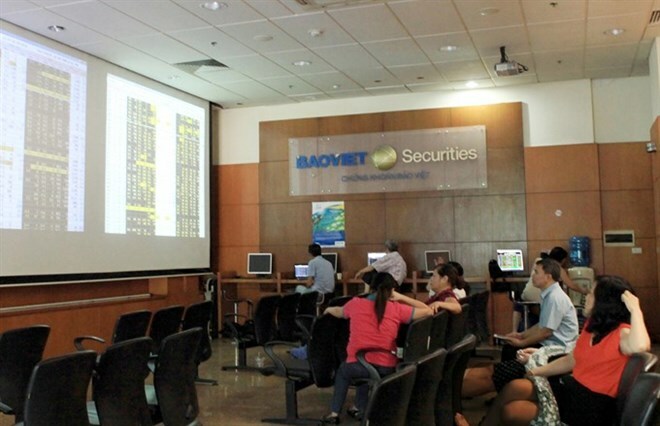 According to vietstock.vn, more than 232.8 million shares, worth 3.28 trillion VND (146 million USD), were traded on both the local bourses in each session. Last week’s daily average trading numbers were down 2.5 percent in volume and 22 percent in value from the previous week. Ngo The Hien, head of market analysis division at Sai Gon-Hanoi Securities (SHS), told tinnhanhchungkhoan.vn during a round-table discussion that the VN Index had moved narrowly in the range of 759 and 777 points for the past two weeks.